Some of your outdoor fan's set-up goes into the category of trial and error. When you put your fan where you want to use it and turn it on for the first time is when you'll begin to really see how much air it moves and start to get an idea of how much cooling it will provide. As you adjust the fan's settings such as speed and angle, you'll be able to see how much the set-up influences the cooling. To be most effective, fans need to have open space all around them or "unrestricted air flow." They need to be able to freely pull air in from the back and freely blow it out the front. The larger or more powerful the fan, the more space it will need. Small tabletop fans may only need a foot or so (30cm) of clearance. Large standing fans may need about a yard or a meter. Ceiling fans need at least 12 inches / 30 cm clearance from the ceiling to be most effective. For really high ceilings you'll want to use long downrods to lower the fan down to where people can feel its breeze. The distance from the ceiling may need to be less when the ceilings are low because of safety concerns -- a ceiling fast must be well above head height. That is, it must be at least 7' - 8' (210 - 240cm) above the floor. If you have a low ceiling, mounting your fan a safe height may not allow ideal clearance above the fan. You can get low-ceiling mounts or "hugger" style fans that will let you install the fan closer to the ceiling, but its air flow won't be ideal. Still, it will ensure no one gets hurt by reaching up into a running fan. You can counter the diminished effectiveness of a fan with inadequate air flow by using more, smaller fans to cool the same sized area, or by using other types of outdoor fans such as standing or table top fans. The smaller fans won't need quite as much clearance, and spacing them around the area will provide the whole area with a cooling breeze. Be sure to allow at least 24" / 60 cm between the blades of multiple fans. Angling the blades of standing fans slightly upward increases the area they affect. Why? Because if the fan is blowing directly horizontal, the ground diminishes that area of air flow. It would be almost like placing the fan partly behind a wall. Anything blocking that air flow will lessen the fans effectiveness. That includes people, too. Though it can feel great to have a fan blowing air directly on you, if there's anyone behind you, they won't be able to feel the breeze because like a wall, your body is blocking the air flow. An advantage of ceiling fans is that the air flow comes from above our heads so there is nothing really to block the air flow. This is also an advantage of oscillating fans because they regularly shift the position of the air flow. The noise an outdoor fan makes can be made louder or quieter depending on how it's set up. A fan vibrates when it's running and this makes noise. A standing fan might make a louder vibrating noise on a cement floor than it would on a lawn. A wall or ceiling fan's vibration could be either muffled or amplified depending on how securely it's installed and how the wall or ceiling is constructed. The space around it also affects the noise level of the fan -- the more enclosed the area, the louder the fan. An outdoor fan in a enclosed patio will seem louder than the same fan in an open area. And the closer someone is to the fan, the louder the fan. Consider where you place the fan. Will it be too close to a conversation area? If so, maybe moving the fan back just a few feet and increasing the speed can decrease the noise level but still keep that area cool. Its often better to use several smaller outdoor fans than one large fan. More, smaller fans can ensure air movement in more areas than just one fan. You'll also be able to use lower fans speeds to get good air flow -- softer breezes can be less of a nuisance than stronger breezes. Smaller fans also allow you to concentrate the air flow exactly where you need it. Why fan a whole patio if you only use a corner of it? Keep at least 24" / 60 cm between the blades of each fan. This ensures the air flow of one fan doesn't cancel out the air flow of another. 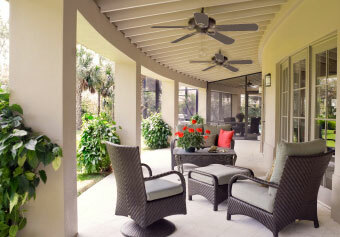 Consider using a combination of outdoor fan styles. A small ceiling fan can be used to cool the middle or one side of a patio and a standing fan or table fan can reach the corners. An open area will allow that moving air to cover as large an area as possible, but will also allow it to dissipate. For example, a canopy or gazebo that's open on all sizes will likely need a larger fan than the same sized area closed on two or more sides. A good general rule to determine how many outdoor fans to use in an open area is that you want to create some air movement where most people will be most of the time. Since there are no walls or ceilings in open areas, you will need to use a free standing fan such as a pedestal or standing fan, a floor fan, or even a table fan sitting on a wall or ledge. Especially with floor fans, the air flow originates low to the ground, meaning people moving around in front of it can more easily block the air flow than if it originated from a higher level. You can lower the chances of that is you use an oscillating fan, or several fans set up around the area to "bathe" it with moving air. Once you've decided where to position your fan the main installation consideration is safety. 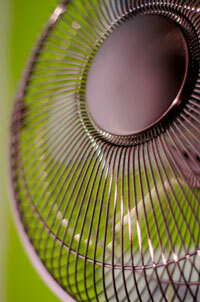 There are many more hazards to be aware of with using an outdoor fan than an indoor fan. They are more likely than indoor fans to be knocked down, subject to water contact or things falling on them. As mentioned before, standing fans need a solid base and may need to be anchored to the ground. Ceiling fans must be mounted too high to reach while they're running. The mountings and electrical connections of outdoor fans must be able to withstand exposure to the elements, especially water. Don't assume you can replace an ordinary ceiling light fixture with a ceiling fan. As well as being much heavier, ceiling fans vibrate when they're running. Replace the light fixture's outlet box with one approved for ceiling fans. Fans over 35 pounds / 16 kg need special mounts attached to the building's frame. Talk to your local home improvement center for instructions if you want to do this yourself. But if you are uncomfortable on a ladder, working with electricity, or lifting the weight of the fan (20 lbs / 9 kg and much more) while on a ladder and working with electricity at the same time (it can be a lot to juggle!) professional installation can be a wise choice. Also consider professional installation if your fan needs to go in a hard-to-reach area. Installation by a certified or knowledgeable electrician can ensure all safety precautions are followed and that any necessary permits for outdoor installation are secured. The wiring must be safe. Connections need to be waterproof -- all wired must be insulated. Wrapping them tightly with electrical tape (which doesn't let electricity pass through it the way regular tapes do) or Teflon tape is a simple solution. Electricity must be grounded. Your outdoor-rated fan should have a grounded (earth return) 3-prong plug to reduce the risk of electric shock. GFCIs (Ground-Fault Circuit-Interrupters) are another measure you can take to prevent electric shock. More and more fans are including GFCIs as part of their cords. They can also be purchased separately and plugged into the outlet before the plug is inserted into it. Fans should never tip over or be knocked over. Permanent installation should be solid and secure against extreme weather and against being knocked into. Temporary installations need to be clearly visible or completely out of the way; fans likely to tip over must be secured to the ground. Heavy weights on the fan's base are one possible solution, but make sure the weights cannot be tripped over. Nothing should be able to fall or reach into the fan blades. Residential ceiling fans should be mounted a minimum of 7 feet / 2 meters (even higher is safer) from the floor and a minimum of 10-12 inches / 25 - 30 cm below the ceiling (your ceiling should be more than 8 feet / 2.5 meters high to use a ceiling fan). 10 feet / 3 meters from the floor is the minimum for ceiling fans in businesses. All fans except ceiling fans should have safety cages around the blades unless the blades move too slowly or the fan isn't powerful enough to cause any damage. The smaller the openings of the cage screen, the safer the fan. Electrical lines (cords) that run from the electric source (house current, commercial current, generator) to the fan itself must be secured to the ground or hung out of the way so they will not be tripped over or run into. Your outdoor fan's set-up must follow local ordinances, including rules of use by any private person or group that oversees the area you will be cooling. Contact them for details. There is no need to keep the fan running if people leave the area for awhile. And when you return and turn the fan back on, the breeze feels great instantly — no need to run the fan before you feel cooler. This can save a lot of energy (especially important if you're using a generator or a battery to power it). Finding a great fan is not a matter of getting the biggest, strongest fan you can find. Stronger breezes can be a nuisance, but even the softest of breezes can provide a sense of cooling. Try instead to cover the area with a soft to firm cooling breeze, even if it means using smaller fans spaced around the area. When shopping, get a general idea of an outdoor fan's power and air flow, look for helpful features, and keep in mind how important set-up is to efficiency and safety. Outdoor fans are one of many ways to keep cool outdoors. If you'd like to learn a bit about other outdoor cooling methods, take a look at our comparison page. If you'd like to learn a lot about any particular method, look into our pages devoted to each method: outdoor shades, misting systems and portable air conditioners. We'll soon have pages on evaporative coolers and battery-powered cooling methods, too. Go to our page on electrical safety outdoors for more on setting up and using your outdoor fan safely. To compare outdoor fans to other outdoor cooling solutions, visit our comparison page.